To celebrate the holidays, the end of the quarter, and the end of another exciting year of research, the NVSL played hooky on the last day of finals and went to see "The Hobbit: An Unexpected Journey" in 3D high frame rate IMAX. There was no real consensus about whether 48 frame-per-second is the next big thing, but we still had a pretty good time. There was unanimous consent, however, that 3D glasses will be part of the standard NVSL uniform from now on. This paper describes Onyx, our prototype phase-change memory-based storage array. It holds 10 GB of first-generation phase change memory and provides a window into the future of fast SSDs. 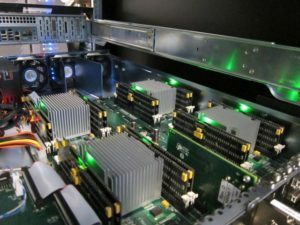 Onyx leverages the NVSL's work on Moneta to minimize software overheads and provide a high-bandwidth, low-latency interface to fast non-volatile memories. Ameen Akel designed the PCM "DIMMs" that form the heart of Onyx. They hold 40 Micron phase change memory chips and hold 640 MB each. He also crafted a PCM DIMM controller that maximizes performance while efficiently maximizing PCM reliability with a lightweight wear-leveling scheme. Ameen will present the work at HotStorage 2011 in June. 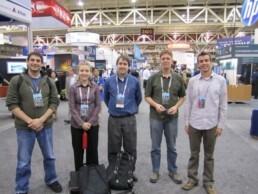 Adrian, Steve, Laura, Ameen, and Joel attended Supercomputing 2010 this week in New Orleans. It was great fun, and Adrian gave a great talk. 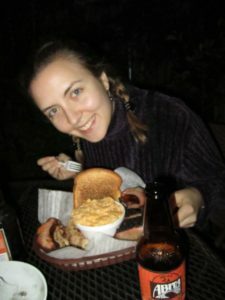 Other highlights of our trip included eating some great New Orleans food including a variety of po-boy sandwiches, jambalaya, fried green tomatoes, some fantastic barbeque, beneigns, and some great key lime pie. There was also a very memorable walking tour of some of New Orlean's less-known sites. To top it all off, Adrian won an iPad!